It is as simple as clicking here to register. 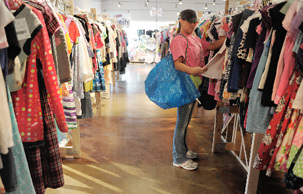 You can choose to sell items and also register to HELP OUT at the sale and shop early! Join our Consignor Group on Facebook for information and answers to your questions. Go clean out your closets and toy boxes. Gather up all the items they are no longer using and have out grown. Use our 24/7 tagging site. We will be taking ALL SEASONS. We've got helpful videos for you, too. Click here for your Consignor Waiver. ..and fourteen days later, your check will be sent! 1. Consign your items! Consignors earn 60% of their sales, less a $10 consignor fee. Consignors who join our team and volunteer earn an additional 10%, for a total of 70%! Join our Consignor Group on Facebook. 2. Valet Consignor - No time to tag? We can help! Valet tagging is open for fall! Want to join our team and help out at the sale? EVERYONE is able to join our team. Being a part of the JBF team gets you in the door to shop first, you earn 70% on your sold items & you have fun! Team Members also get to shop EARLY! Wednesday, Apr 3rd between 3:00 pm and 8:00pm. Bring in one item so we can check you in. Sign your waiver (you can either print off and fill out ahead of time or we will have one for you). Click here for consignor waiver. You will then proceed to put your items on the floor in the appropriate areas. i.e., girls clothing size 2. on the racks behind the size 2 holder, books on the book table, etc. WE WILL INSPECT AND REMOVE ALL UNACCEPTABLE AND RECALLED ITEMS AFTER DROP OFF. 1. Please come ready to the Check In area with applicable waivers, and one item. 2. Once inside, check in, and take your items to the sales floor. We have rolling racks available on a first come, first serve basis that you can transfer your items onto for putting out on the sales floor. We recommend having your items sorted when bringing them to make your drop off process smoother. Clothes together in size and gender. Similar toys together, etc. PICK UP for all Consignors: Sunday, Apr 7th between 12 pm - 2 pm. All items not picked up will be donated. Sorry, no exceptions! When you get to Louetta Automotive Sports Complex, proceed to the same area as dropoff. 1. Check in with a greeter or the Check Out table . 3. 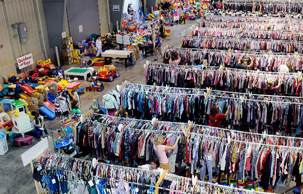 Head to the clothing racks and floor look for your consignor #, they will be in alphabetical order. 4. Don't forget to check the missing tag area. Once you've grabbed your items and we've double checked them, fill out your pick up verification and you're on your way. Books: Please use caution when attaching tags to books. Do not use packing tape. We recommend using BLUE PAINTERS TAPE OR REMOVABLE SCOTCH TAPE. This adheres nicely to the book but peels right off without causing damage to the book. Bundle several books together using a ziploc bag and attach the tag to the outside of the bag. Seal the top of the bag with packing tape. Beginning Fall 2018 We NO LONGER ACCEPT BREAST PUMPS. Click HERE to join our FB Consignor Group!